DBAs need help with tackling significant issues, including doing more with fewer resources, quickly responding to upgrade and patch needs, while reducing the time spent on cloning databases. Finally, they need help eliminating the time they spend integrating, testing, and deploying full-stack cloud solutions. How can DBAs reconcile these competing demands? 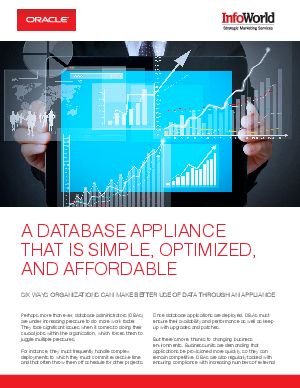 Learn more about expanded offerings in a database appliance that are delivering numerous advantages. These new configurations have the potential to help IT derive new benefits in its efforts to serve the business.